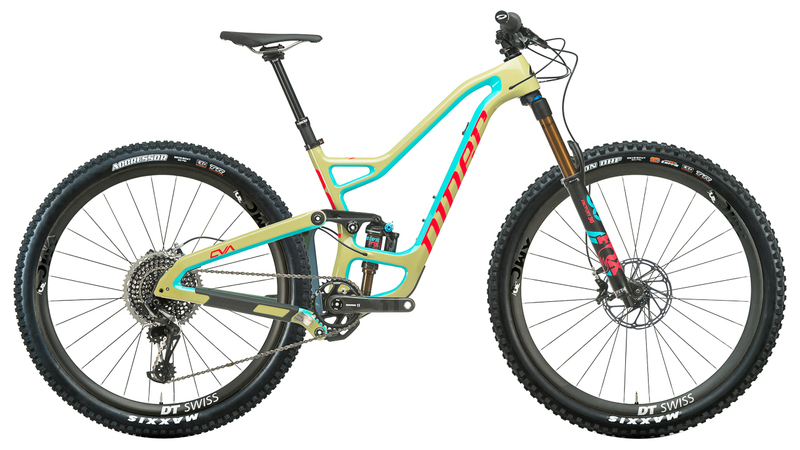 Take a gander at the brand new 2019 Niner RIP 9. Long travel bikes are becoming the norm in the mountain biking world and there is a good reason for it. Advancements in suspension technology have made it so long travel mountain bikes can descend smoothly and still climb efficiently. The 2019 RIP 9 is here to sit upon the throne as the king of the mountain. It features an RDO carbon frame which is both lightweight and incredibly durable and perfect for the trails. The frame features Niner's CVA, or Constant Varying Arc, suspension design which lets you climb efficiently and descend smoothly. It features Boost hub spacing on the front and rear that delivers a stiffer and more predictable ride. The 2019 Niner is longer, slacker, and lower than any bike Niner has ever made, and it even features a geometry flip chip if you want to get extra low (65-degree HA in low setting). Compared to the previous generation, the 2019 model also has a wider and stiffer rib cage main triangle for precise handling, clearance for 2.6” tires, and a refined suspension curve for a sensitive early stroke and supportive mid stroke. Also, if you like to tinker on your own bike, you’ll love how the 2019 RIP 9 has full sleeve internal cable guides, factory installed frame protection, and durable long-lasting Enduro Max Black Oxide pivot bearings. The 5-Star version of the Niner RIP 9 RDO comes with a SRAM X01 Eagle 12-speed drivetrain with 10-50 tooth gearing so you can ride up and down any terrain. The SRAM Guide Ultimate hydraulic disc brakes provide the confidence-inspiring stopping power you need for any descent and a Fox 36 Float Factory fork and Fox Float DPX2 rear shock offer industry leading suspension performance. Both have Fox's Kashima Coat which provides a durable shock that is buttery smooth. DT-Swiss provides the wheelset with their XMC 1200 Carbon wheels which provide a tubeless ready setup so you can run lower tire pressures for increased traction and a smoother ride. If you're looking for the ultimate mountain bike, then you'll love the 2019 Niner RIP 9.